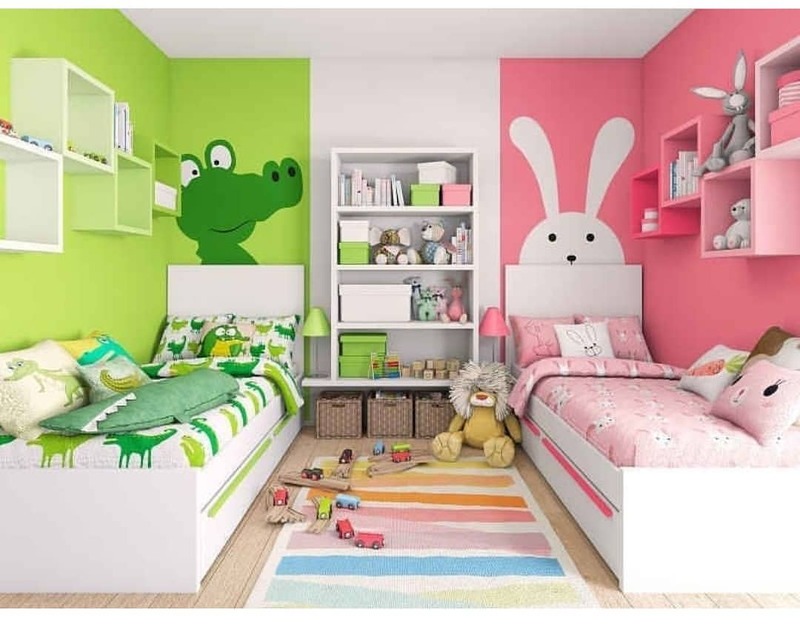 When it comes to the design of a guest room or shared children’s bedroom two twin beds are a great choice. This furniture arrangement works best for rooms that are tight on space. 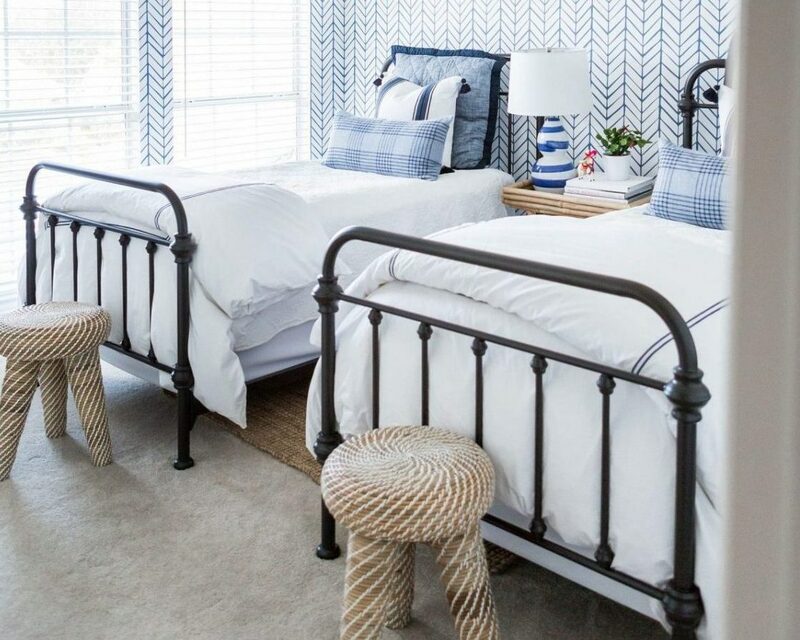 Put the beds in such a way that their headboards are at an angle. You can fill the corner created by the beds with a shelf or a table. The beds can also have storage compartments underneath. Let’s say a room with twin beds is shared by two kids with totally different tastes. You can personalise their space by covering the beds with different coloured bedspreads. You can also put up wall art according to the choice of each child. While doing this, make sure the colours do not clash. Otherwise, you will end up with an over powering room. If you have to use a small room as a sleepover or guest bedroom, you can build a platform that has two levels. The platforms can be an alternative to bed frames and all you have to do is put the mattresses right on top of them. Double up the decor by decorating everything with symmetry. For example, you can place a bench at the foot board of each bed. To make it even more symmetrical, you can flank the beds with small nightstands. Identical wall decor above the headboards will complete the room and make it magazine-worthy. A rug brings warmth and cosiness to a bedroom. You can place a rug on the floor space in between the two beds. This will introduce pattern and texture to the room as well. To give your twin bedroom a hotel-like feel, you can hang a canopy above each bed to make it luxurious and chic. For a fun kids’ room, you can choose canopies that are shaped as flowers or inspired by a carnival carousel. If you want to shift the attention of the viewer from beds that may look too boring, you can decorate using a theme. Before eyes are drawn to the beds, they will take notice of the rest of the decor. The themes you can choose can be beach, coastal, rustic or even farmhouse. Wall lights look classy and bring functionality to a room. 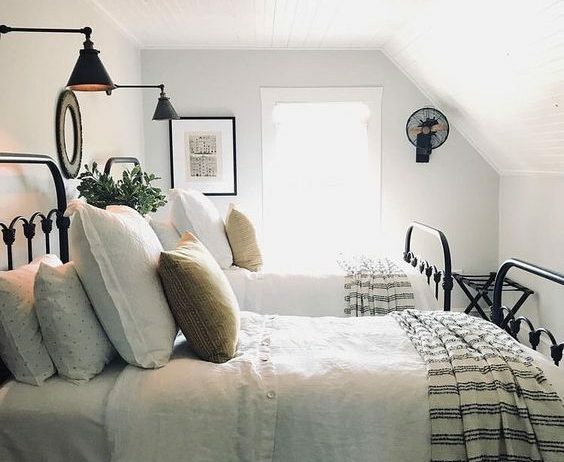 If the room is shared by two fond readers, then you can provide a light for each right next to the bed, above the nightstand.